The Multicorer is one of those instruments that does exactly what its name implies: it takes multiple cores at every deployment. It can be configured to take up to eight samples at one drop. It has no electronic connections or computer configuration, but simply works off of gravity and precision-made moving parts. The central device is called the “spyder” because of its eight arms. On these arms, up to eight coring tubes can be attached. Tubes can consist of the more expensive poly-carbonate materials, or the cheaper butyrate version. The polycarbonate tubes cost more due to the time and materials it takes to manufacture each one. For archiving samples, the butyrate tubes are a better choice not only for their cost, but for their ability to be cut down to the level of the sediment in the tube. Each of the tubes is fit into a housing that has a hinged rubber stopper at the top and a shovel at the bottom that closes as the tubes are lifted up. 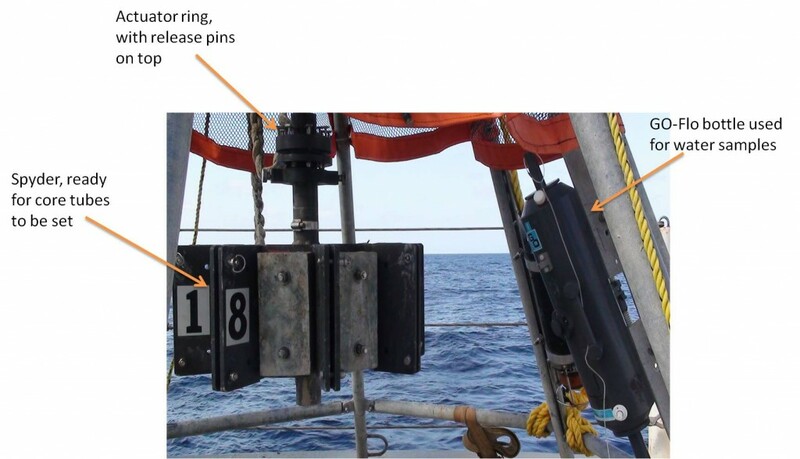 All pins and springs are released through the motion of gravity as they lower once on the seafloor or when tension is exuded on the line as the Multi-corer is brought back up to the surface. 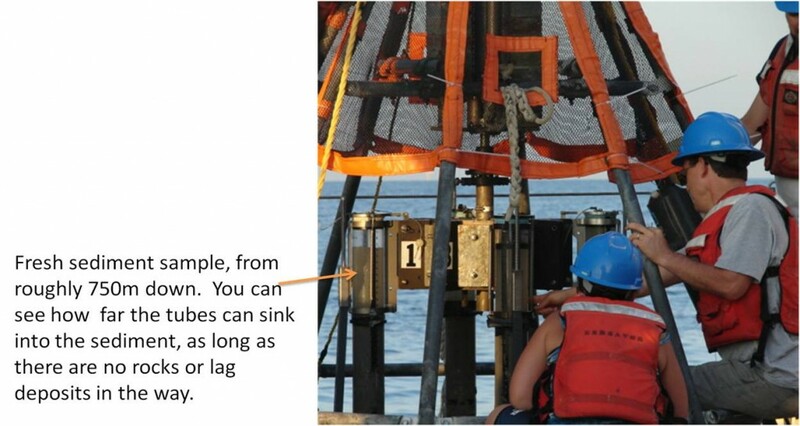 To deploy, the multi-corer is picked up by the winch wire, lowered over the water with the aft A-frame, and sent down into the depths of the ocean. Once it lands, the legs begin to sink in the sediment and the middle column, which the spyder is attached to, also begins to lower. The tubes slowly sink into the seafloor sediment, trapping that sample along with its overlying bottom water. The winch is stopped after about 2 minutes on the bottom; the wire is hauled in and the Multi-corer is slowly raised up and out of the sediment. As the line becomes taught, the center column again rises up. This time the actuating ring in the center has tripped two spring pins which now releases the lanyards attached to each tube’s stopper. The stopper on top of each tube falls and seals each tube which creates a vacuum that holds the sample inside the tube until the “shovel” swings down, and closes off the bottom of the sample. As the Multicore is hoisted back onto the deck, all samples remain locked inside their tubes until released for study or archiving. The tubes are lifted off of the spyder and taken to a room kept at roughly the same temperature where the collection occurred; in other words, the deeper the sample, the colder the lab. The coring system easily captures samples at any depth. 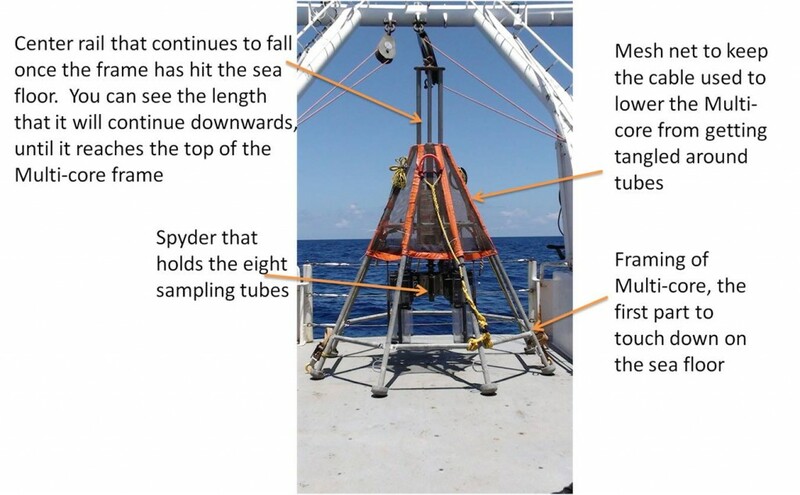 The materials used in its frame, as well as the sample tubes, are able to withstand the increased pressure thousands of meters beneath the ocean’s surface. It can also be outfitted with an “acoustic pinger” to help pinpoint its depth during deeper deployments, and can have a GO-Flo bottle attached to it to collect a water sample from the sea floor. 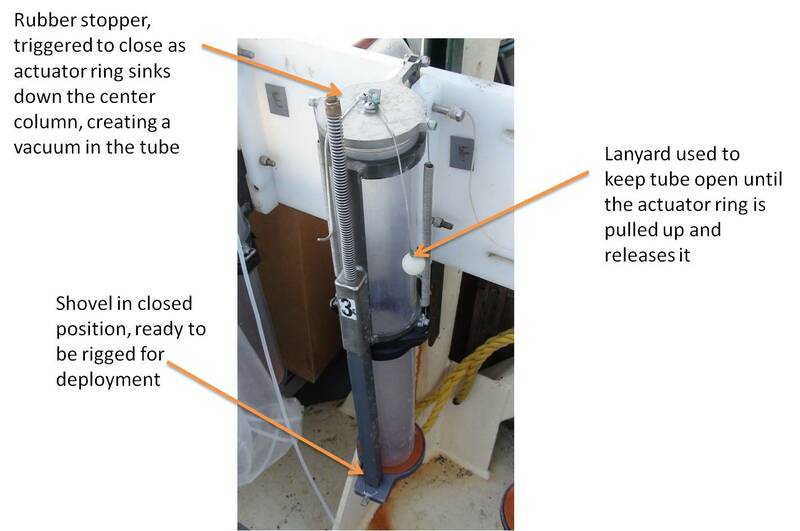 The sample bottle is closed by a lanyard system, the same way the core sample tubes are closed. Scientists can use these samples to study all things from biology to biogeochemistry to water chemistry from a location that is beyond unforgiving to human exploration.